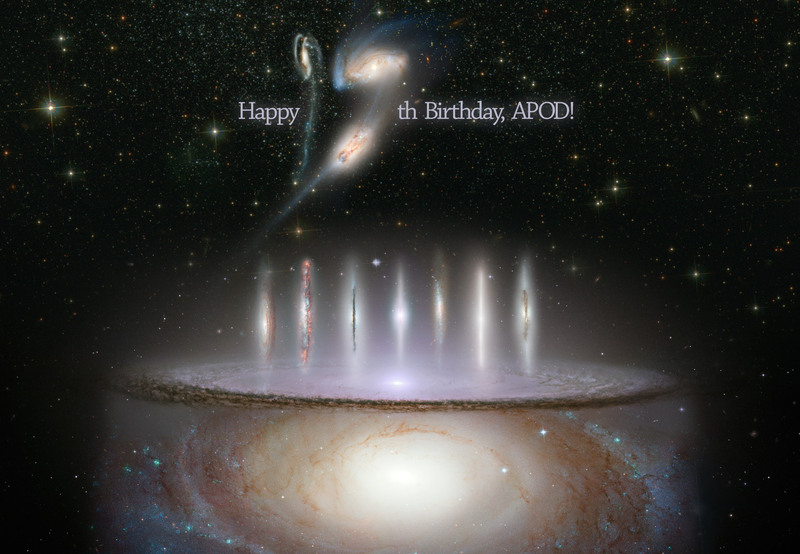 Explanation: The first APOD appeared seventeen years ago today, on 1995 June 16. Although garnering only 14 page views on that day, we are proud to estimate that APOD has now served over one billion space-related images over the last 1.7 decades. That early beginning, along with a nearly unchanging format, has allowed APOD to be a consistent and familiar site on a web frequently filled with change. Many people don't know, though, that APOD is now translated daily into many major languages and featured on social media sites and smartphone applications. We again thank our readers and NASA for their continued support, but ask that any potentially congratulatory e-mail go to the folks who created the great pictures -- many times with considerable effort -- that APOD has been fortunate enough to feature over the years. Many can be contacted by following links found in the credit line under the image. Today's birthday collage includes numerous galaxies captured by the Hubble Space Telescope.